Not in the festive spirit yet? Bake a batch of these Hemsley spiced biscuits and fill your kitchen with the scent of Christmas. 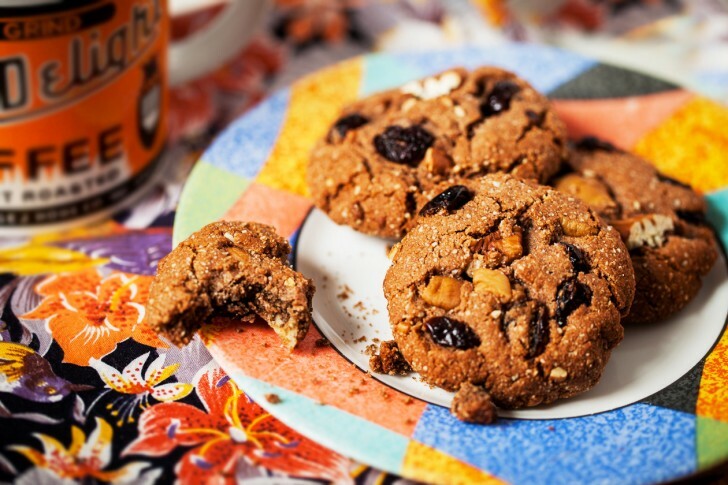 These festive biscuits are almond-based, so naturally gluten and grain-free and sweetened with a touch of rich maple or date syrup. Bursting with dried cranberries and pecans for the perfect balance of crunchy and chewy, these healthy treats will fill your home with the comforting aroma of winter spices ginger, cinnamon and nutmeg. We’ve started serving them at our Hemsley Cafe in Selfridges for Christmas and they’ve proved a real hit, so if you fancy a day off from cooking pop in and see us in The Body Studio on level 3 and enjoy them with a mug of Mexican Hot Chocolate. Yum! Preheat oven to 175°C / 350ºF. Mix ground almonds, spices, sea salt and baking soda in a bowl. Stir through the cranberries and chopped pecans. Stir in maple syrup until well combined. Dough will be crumbly. Take approx. 1½ tablespoon of the mixture and shape into a rough cookie with your hands. Place on a baking tray lined with parchment paper, pressing each biscuit lightly with the flat of your hand to approx. ½ cm (⅕ inch) thick. Repeat with the rest of the mixture, leaving plenty of space between biscuits. Bake for approx. 12 minutes, until browned at the edges but still soft in the middle. Oven temperatures vary, so keep an eye on the biscuits after 10 minutes. Let cool for 10 minutes to crisp up before serving. Store in the fridge in an airtight glass container. You can also freeze after baking and defrost at room temperature as desired.